New Delhi : The much debated odd-even formula of private vehicle traffic has hit the roads of Delhi since today morning. The Kejriwal-led AAP government, in co-ordination with NDA-led Central government (read Delhi police) has begun testing waters on the odd-even plan, according to which, odd numbered privately owned vehicles (the last digit) would ply on the roads today (four wheelers), and it would be the even numbers’ day tomorrow. Working on an alternate day phenomenon, the AAP government has planned out a fortnight of dry run in a live situation of ever growing Delhi traffic with an aim to curb down the high level pollution-indexed state. Arvind Kejriwal carpooled with his ministers today and flagged off the odd-even plan. He told media that he is overwhelmed by Delhi’s response towards the odd-even plan. 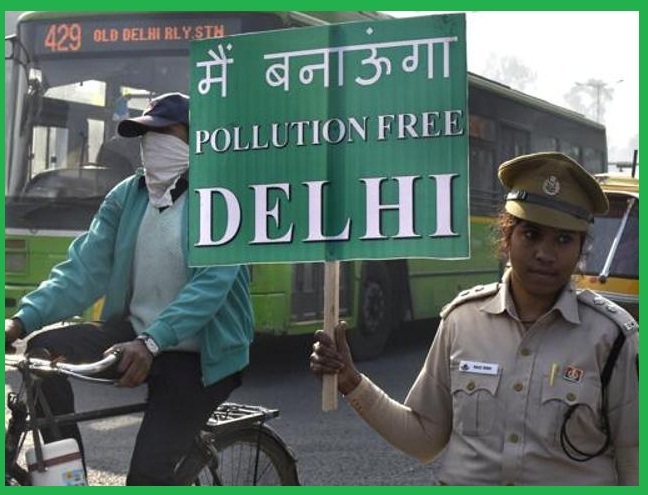 The Delhi government’s big experiment to get private cars off the roads to check pollution levels in the national capital kicked off, starting on a trial basis for fifteen days. The thumb rule being — cars with odd-numbered licence plates (last digit) would only be allowed on the roads on odd-numbered dates and those with even-numbered plates on the others, the rule being applicable from 8 am to 8 pm. The rule will not apply on Sundays. The initiative will run for an initial two-week trial period after which the government plans to reconsider and take a call on extending or discontinuing it, as the situation pegs in. With the central aim of reducing pollution levels in the city-state, the government has also decided to shut down some coal-fired power plants and vacuum roads to reduce dust to combat the rising levels of pollution. To facilitate commuters and save them from inconvenience, Delhi government has hired 3,000 private buses and scheduled additional metro rides to cope with the extra rush due to lesser cars. AAP government is optimistic that the scheme could be introduced on a more permanent basis if it is a success. To send a strong message to people, Chief Minister Arvind Kejriwal and his cabinet ministers have carpooled to work. Thousands of civil defence volunteers are being be deployed to assist the Traffic Police. The traffic management is co-teamed with helping hands from enforcement teams of Delhi government’s transport department and authorized sub-divisional magistrates, who have vowed to work in tandem and enable implementation of the scheme. The violators of the scheme have begun getting fined a sum of Rs 2,000. All women vehicles have been spared from the odd-even clutch, along with CNG vehicles.